In a big blow to AIADMK faction group leader TTV Dinakaran, the Supreme Court (SC) on Wednesday kept in abeyance the Delhi High Court’s single judge bench order allowing him to use a common poll symbol -- preferably 'pressure cooker' -- and a suitable party name to carry on with his politics. A bench of Chief Justice Dipak Misra and Justice AM Khanwilkar asked the Acting Chief Justice of Delhi High Court to constitute the division bench which was ordered to decide by April-end the plea of Dinakaran against the Election Commission order granting the 'two leaves' symbol to a faction led by Tamil Nadu Chief Minister O Palaniswami and Deputy Chief Minister O Panneerselvam. The SC bench, which was hearing the plea of Palaniswami and Pannerselvam against the high court order, also ordered Election Commission of India (ECI) not to pass any order pursuant to the Delhi High Court order. A battery of senior advocates appeared for both the parties. Senior advocates Mukul Rohtagi, CS Vaidyanathan and KV Vishwanathan appeared for the CM and others. For Dinakaran, senior advocates Ashok Desai, Amerendra Sharan and Meenakshi Arora appeared before the bench. On March 9, Justice Rekha Palli of the high court had allowed Dinakaran to use. common symbol and directed the Election Commission to do the needful within three weeks after giving the Dinakaran faction of the AIADMK an appropriate hearing. The HC said ".......while upholding the petitioner's (Dinakaran) right to seek the use of a common name and symbol by way of an interim arrangement during the pendency of the writ petition, I deem it appropriate to direct the Election Commission of India, which has the necessary expertise to deal with allotment of symbols, to pass an appropriate order to permit the petitioner and his group of persons to use a common symbol (preferably 'pressure cooker' as used by the petitioner during R.K. Nagar constituency bypoll) and also permit them to use the (party) name of their choice, after giving them an appropriate hearing." The court was hearing Dinakaran's plea for permission to use "pressure cooker" symbol for local bodies elections likely in April in Tamil Nadu. He claimed that he won with thumping majority with the symbol ‘pressure cooker’. 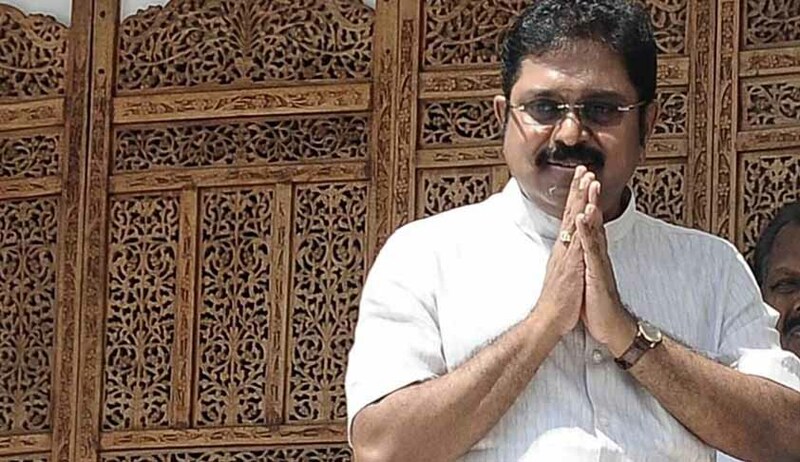 In December 2017, Dinakaran won the Radhakrishnan Nagar bypoll as an Independent which he contested with 'pressure cooker' symbol. Dinakaran approached Delhi High Court challenging the Election Commission order to award the 'two leaves” symbol to Palaniswami and Panneerselvam. On March 15, Dinakaran launched new political party Amma Makkal Munnetra Kazhagam and unveiled party flag which carries the image of former Tamil Nadu CM J Jayalalithaa. (i)The counter affidavit filed by the present petitioners before the High Court shall be taken on record and as accepted by learned counsel for the petitioners, no further opportunity shall be granted for filing a counter affidavit. (ii) Rejoinder affidavit, if any, be filed by the respondents within two weeks hence. (iii) The learned Acting Chief Justice of the High Court is requested to constitute an appropriate Division Bench, so that they can decide the lis in question. (iv) The Division Bench so constituted is requested to dispose of the main matter by the end of April, 2018, as this matter requires immediate attention. (v) The interim order passed by the learned Single Judge on 9.3.2018 shall remain in abeyance. (vi) As we have kept the order in abeyance, the Election Commission shall not pronounce its order. (vii) In case there is any notification for an election, liberty is granted to the parties to approach this Court.